Long Island University’s new 110,000 sq. ft. state-of-the-art Wellness, Recreation, and Athletic Center is home to the Long Island University Blackbirds basketball team. Moreover, the center is a premier recreation center for the entire student population. With a street level lobby overlooking the fitness center and natatorium, the building houses first-class health, recreation, and athletic facilities, including a 20,260 sq. ft. arena, and a 15,000 sq. 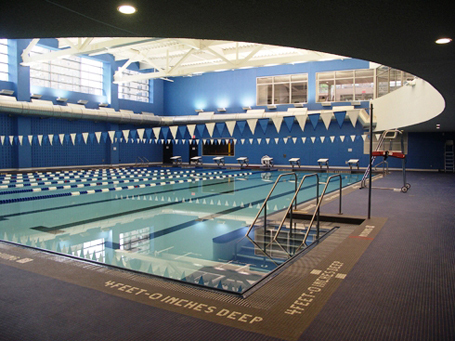 ft. wellness center that includes a 25-yard competition pool with eight lap lanes designed by Counsilman-Hunsaker. The fitness center includes a weight room, aerobic room, and locker/shower areas. The wellness center provides rehabilitation space for treatment of asthma, cardio respiratory, and sickle cell anemia. The center enables its strong health science programs to integrate a teaching practicum with a major New York City hospital. In 2007, Counsilman-Hunsaker provided support for regulatory approval from the Health Department and Department of Environmental Protection for the addition of a 96 sq. ft. therapy pool, which is equipped with a hydraulic moveable floor, internal treadmill, and a swim-in-place Badu Jet system.